In two weeks I have gone from feeling completely out of my element in Vila Central Hospital to instantly feeling at home at Grey Base. I was greeted warmly with “Welcome back!”, “You obviously couldn’t get enough of us” and “Did I see you in the paper?”. 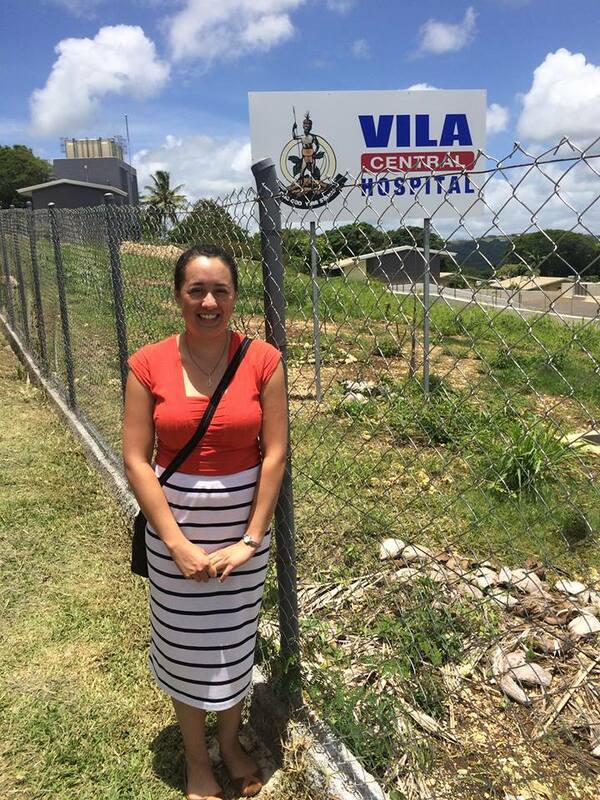 Final days in Vanuatu – finally getting the token shot by the hospital sign. I’ve been enjoying my time back in Greymouth so much I didn’t realise how easy it was for me to readjust to being home. I had pictured a sort of reverse culture shock when I arrived back home and was surprised to find this wasn’t the case. I know I was only gone for six weeks, but I was expecting that I would spend at least the first week feeling slightly guilty about all the benefits of living in a developed country. 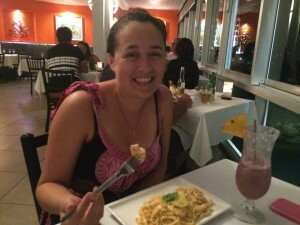 One thing I can say for certain, and which may perhaps explain why I settled back in so quickly, is that I had to harden myself to the conditions in Vanuatu. Anyone who knows me well will be aware that I can cry with very little provocation. So when I flew into Port Vila in November and saw the condition of the houses from the air I could see I was going to have a difficult time holding it together when I saw the inside of the hospital. 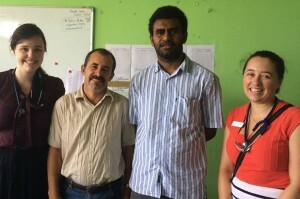 The people of Vanuatu are in an unfortunate transition between the infectious conditions of an underdeveloped country and the chronic diseases that are typically found in already developed countries. Infectious conditions are well treated due to an abundance of resources to deal with these, but chronic conditions such as diabetes or cancer, have very limited options for treatment. This makes for some very unwell people and I am only realising now how upsetting this all was. In order to make it through my elective, I had to distance myself from many of the patients. I found this difficult to do on the paediatric ward and as a result I became very upset over the prognosis of the child with suspected leukaemia (who I mentioned in my last blog). I look forward to hearing from my colleague Jessica who has been investigating ways to help children with leukaemia in Vanuatu. But let’s move on to some more positive things that I learnt while I was in Vanuatu. I can say without a doubt that I am far more aware of the huge number of unnecessary tests we order here. I find myself seriously considering each investigation I am ordering, what extra information it will give me and whether this will help with the management of the patient in front of me. This is not something I expected to learn in Vanuatu but having adapted to life without a CT scanner and specialised blood tests, it’s no great surprise that this is the result. As a consequence of this, I have also learnt the importance of taking a good history. Due to the lack of resources, doctors have no choice but to rely on the information they get from the patient. Applying this logic to my own practice has shown me that it is possible to make a diagnosis based solely on a history (although I have the advantage of being able to check my suppositions with things like CT scanners and specialised blood tests). Both of the above things are reiterated over and over in medical school but it wasn’t until I went to a place that didn’t have all of the benefits of my own country that I finally realised what my teachers had been talking about. 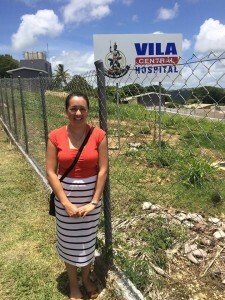 To finish off this blog I wanted to talk about the areas that I felt Vila Central Hospital could use help so that future students could consider what they could take with them on their elective. 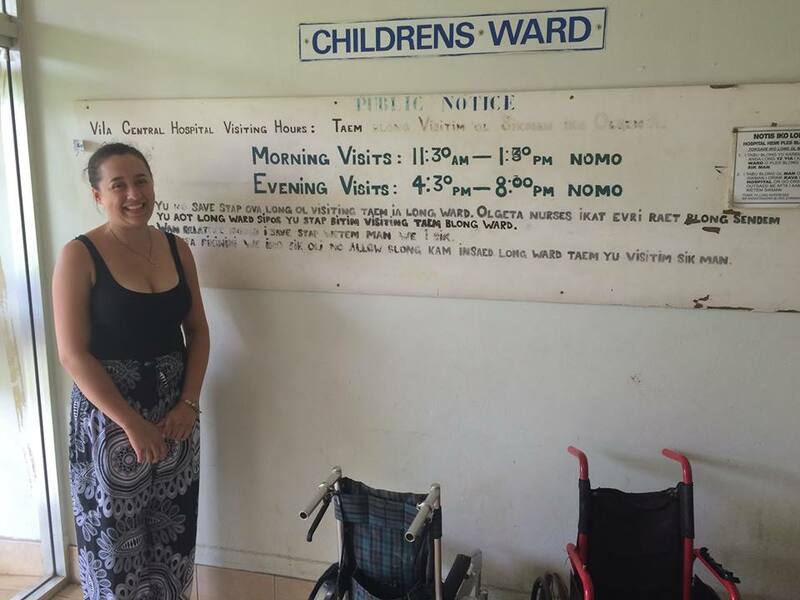 Places like this will always need more hands but from my point of view, the patient load is currently reasonably well handled by Vanuatu’s own doctors, the Ausaid-funded doctors and those few who choose to move to Vila and work. My biggest concern is that the hospital needs more of the basic resources we take for granted and I wondered if perhaps this should become an area of focus. There is a startling shortage of sterile and non-sterile gloves, absorbent towels (bluey’s or greeny’s as they are affectionately known by many), alcohol gel and wipes and other simple things like this. The maternity ward needs more than two CTG machines so they can monitor fetal heart rates during labour as well as functioning resuscitaires for when things go wrong. The entire hospital needs proper sharps bins, better cleaning products and rat traps by the dozen. 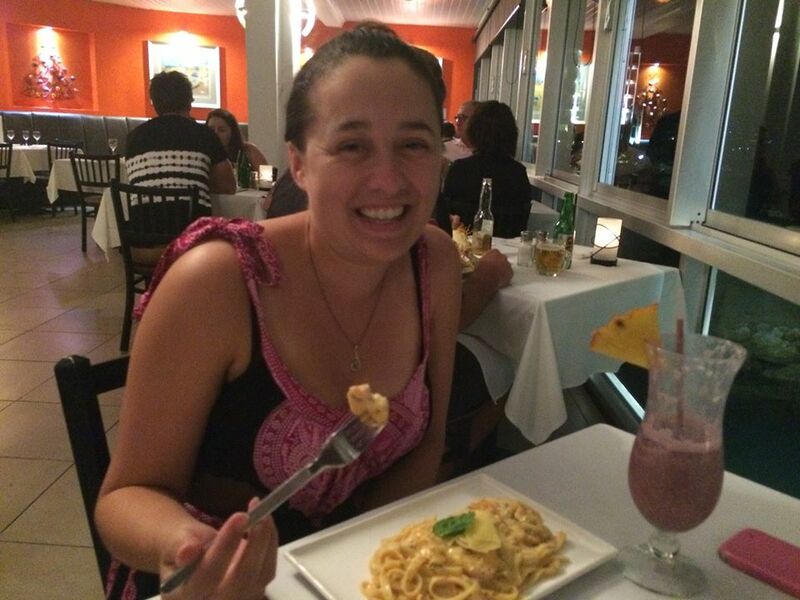 The lab needs a more reliable source of reagent for their biochemical tests (every week or so were informed they were unable to do LFT’s, albumin or bilirubin) – the list goes on. Snorkelling off Iririki Island – best snorkelling of the trip. If you are considering Vanuatu for your elective, contact Medical Aid Abroad early to see if you can get your hands on some of the above. It’s also a good idea to contact specific wards or areas in the hospital if you can to get more detailed lists of their needs. It’s been an amazing privilege to be able to write about my experiences and I am sad that it has come to an end. I have learnt a great deal more than I am able to process and write down for you all but what I do know for certain is that I am grateful to live in a place with such a great healthcare system. 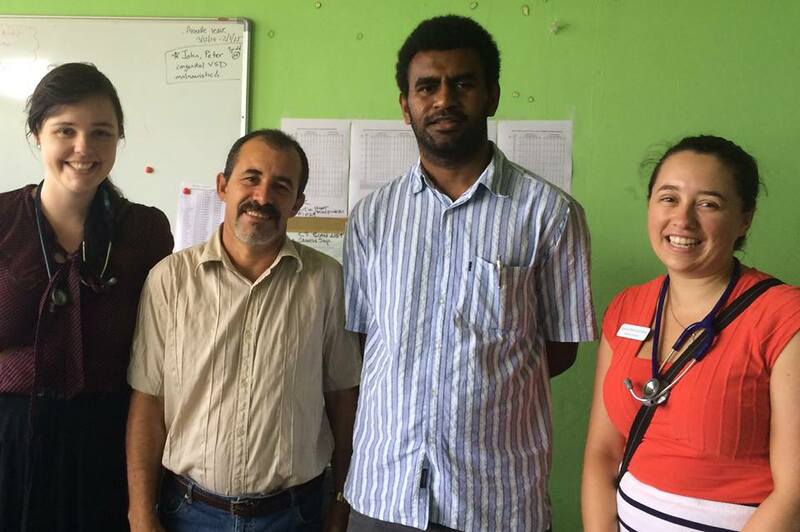 While I plan on continuing to study and work in New Zealand (and, all going well, eventually in a rural community) I hope to be able to go back to Vanuatu one day, if only to take more resources and catch up with all the lovely people I met.